The Barnstormers were victorious for the second time in a row as they defeated the Dallas Vigilantes 59-38. The Barnstormers started off slowly in the first quarter scoring only once on a Vena to Schmidt 39 yard touchdown pass. The second quarter was an different story as the Barnstormers scored twice along with a safety from a Micah King sack, while holding the Vigilantes to three points. The Barnstormers went into halftime with a score of 23-17. The momentum continued to grow in the second half of the game as the Barnstormers once more making it four consecutive drives in which the Vigilantes were unable to produce and the Barnstormers scored. Defensive backs, Tanner Varner and Khalil Carter each had an interception in each quarter of the second half respectively. The Barnstormers went on to score three more times in the fourth quarter bringing the final score to 59-38. With only one more road game after this matchup with Oklahoma City the Barnstormers need to continue their success on the road to keep their playoff hopes alive. The Yard Dawgz were defeated by the Barnstormers earlier this season by a score of 68-60 in the Barnstormers first of two victories at home this season. The Yard Dawgz have been an up and down team this season leading them to a record of 5-7 after two consecutive victories over the Dallas Vigilantes and Bossier-Shreveport Battlewings. Iowa Barnstormers @ Oklahoma City Yard Dawgz will be broadcast LIVE on 1700 AM The Champ, and on the Internet at www.theiowabarnstormers.com and at www.nifty-tv.com. 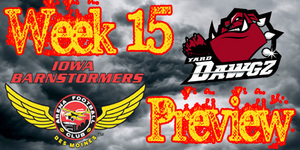 -This is the fourth meeting between the Oklahoma City Yard Dawgz and the Iowa Barnstormers. The Barnstormers currently lead the series 2-1. -Leading Tackler: Fred Shaw (#8) - 12 GP, 69 tackles (47 solo, 22 assisted), 1 interception for 9 yds, 17 pass breakups. Tanner Varner-DB-#20 Week 14 Line: 8 solo tackles, 1 interception for 21 yds and 2 pass breakups. Tanner Varner has been absolutely dominant in the backfield against opposing teams. Last week Varner recorded his seventh interception of the season along with breaking the 100 mark in tackles for the season. Varner is on pace to smash his team record of 120 tackles last season. Varner currently leads the league in average tackles per game in all positions along with ranking in the top five for interceptions per game and total interceptions. Don’t forget to get your tickets for the next home game Friday July 16th when the Barnstormers take on the Shock! This game will be broadcast on NFL Network. Call the Barnstormers Front Office to get your tickets TODAY: 515-633-2255!